The year was 1993. I was seven years old. I was into Power Rangers, baseball and cartoons. I loved cartoons. I learned a lot from watching television as a kid. Growing up, I was the type of kid to try everything I saw on TV in real life. Not just the crazy stuff, but the life skills as well. I remember watching an episode of a cartoon that was teaching how to trade things. I couldn’t believe what I was learning. I knew what trading was of course. I would trade my cookie for someone’s gummy bears at lunch, or I would trade my M&Ms for someone’s Skittles, but I didn’t realize that you could trade things that you didn’t want or need for things that you wanted! This was a huge revelation. I knew a kid who lived up the street from me who had an Etch-A-Sketch. I had always wanted one. I thought that I would try trading the kid for it. I liked all of my toys; even though they were mostly hand-me-downs. I didn’t want to part with any. Then I saw it. 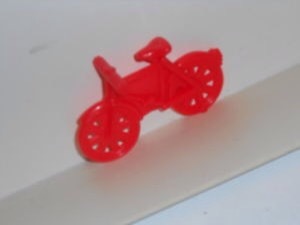 A little red toy bicycle from an action figure set. Nothing moved on it, it was just one solid piece of plastic, but it would have to do. I really wanted that Etch-A-Sketch. So I waited in my front yard until I saw him go outside to play. I called him over to my yard to see if he wanted to play. That’s when I began showcasing my little red bicycle. I took the 1.5 inch tall 3 inch long toy and began playing with it like crazy. I even let my friend play with it too, so he could see just how much fun it was. When he was playing with the bike, that’s when I said, “You know… you can have that bike if you want. We could trade for it!” He asked me what I meant and I said, “We can trade toys! I’ll give you this cool little bike and you can give me your Etch-A-Sketch” He wasn’t too keen on the idea of giving up his toy so I went to work selling how awesome this bike could be. I went over to the picket fence in the front yard and started doing “Jumps” from post to post with the bike. I said, “See, the bike can do jumps and everything. You’re Etch-A-Sketch can’t do jumps” He agreed with me and eventually I was able to get him to trade his awesome toy for my not-so-awesome one. I was so proud of myself. I was able to take a worthless toy and convince someone to trade a treasure for it. I was King of the World! For about 20 minutes. I went to the backyard and sat on the swing. I was playing with my new Etch-A-Sketch when my dad came out to see what I was up to. He asked me where I got the Etch-A-Sketch from and I told him the story of what transpired to result in my having a cool new toy to play with. That’s when the cruel dark fist of reality came crashing down on my soul. My dad told me that what I did was wrong. I pleaded with him that it was a trade and he WANTED to trade with me; he WANTED the little red plastic bike. My dad taught me that in order for a trade to be fair, both sides need to get equal value. My toy bicycle wasn’t worth the same as the Etch-A-Sketch. The kid up the street was not getting a fair deal. It was a hard concept for me to learn, but I came to understand what he meant. My dad told me that trades are like a scale. On one side you have what you are giving up and on the other you have what the other guy is giving up. You want those scales to even out. He also told me that trades can be uneven in value if the items mean something to the other person. For example: if the kid had the same toy set that they bike came from but he had lost his bike and wanted to replace it so he could have the whole set again, then it would be a more fair trade. But since that wasn’t the case I was wrong for making that trade. My dad made me go down to the kids’ house and explain that I was wrong for making the trade with him. That it wasn’t a fair trade. It was one of the hardest things I had to do that year. 1993 taught me many things, how to swindle kids out of cool toys but also that it’s totally NOT cool to do so. It also taught me that doing the right thing usually pays off. Fast forward four months to Christmas morning. Guess what was under the tree. This toy is similar to the one that I traded for the Etch-A-Sketch.